The Dell PowerEdge R230 is a single-socket server that delivers high value performance, perfect for entry-level workloads. This 1U server is versatile and powerful, with a price tag that won’t break the budget. To tackle compute-intensive tasks, select your choice of processor from the Intel Xeon E3-1200 v5 processor family for up to 3.7GHz 8MB quad-core. Offering twice the memory capacity over the previous generation Dell PowerEdge R220, the R230 scales up to 64GB of DDR4 memory with 33% faster transfer rates over previous generation DDR4. Two PCIe Gen 3.0 slots boost data throughput, driving twice the throughput over Gen 2.0. Aventis Systems carries the Dell R230 server with either 4x 3.5” hot plug hard drive bays or 2x 3.5” non-hot plug hard drive bays. Please browse our PowerEdge R230 servers below and click customize to build your custom configuration! 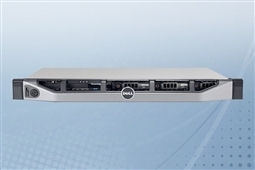 Aventis Systems carries New Dell PowerEdge R230 servers. All servers from Aventis System include a 3 year Comprehensive Warranty, with eligibility for optional Express warranties and onsite services. 1TB (2 x 500GB) 7.2K 6Gb/s SATA 3.5"
4TB (2 x 2TB) 7.2K 6Gb/s SATA 3.5"
292GB (2 x 146GB) 10K 3Gb/s SAS 3.5"
600GB (2 x 300GB) 15K 6Gb/s SAS 3.5"
6TB (2 x 3TB) 7.2K 6Gb/s NL SAS 3.5"